My previous post I wrote and quoted some important statements of the importance to discipline and prioritize innovation tracks sourced cross-wide the company. Also, I’ve referenced the below picture from the HBR’s note: Build an innovation engine in 90 days by Scott D. Anthony, David S. Ducan, and Pontus M.A. Siren. The first 30 days are mostly engaged to classify these projects in two different buckets: Core or New-growth innovations. A failure to understand the difference between the two buckets causes “to either discount the importance of innovations that strengthen the ongoing business or to demand to much revenue from the new-growth initiatives too early”. 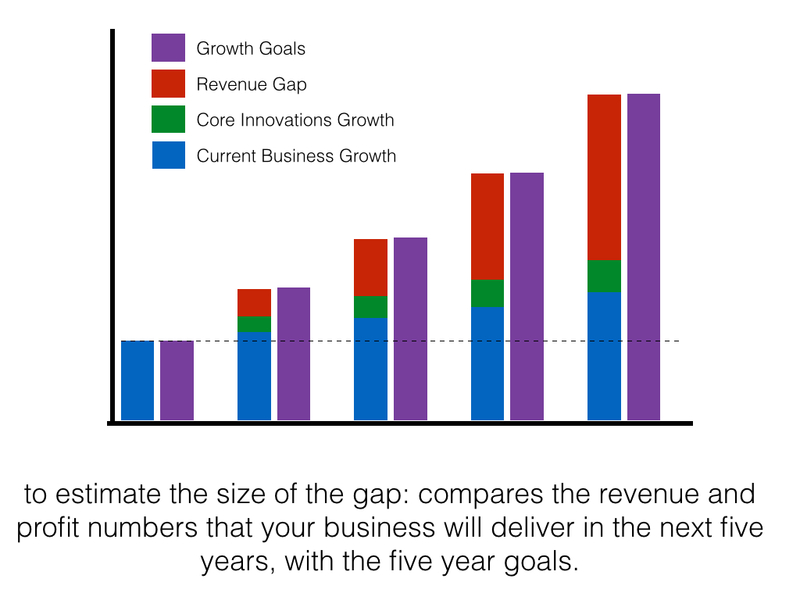 Estimate the size of the gap: compares the revenue and profit numbers that your business will deliver in the next five years, with the five year goals. If this growth gap is fairly large, “you may wish to subdivide you growth efforts”. Next picture illustrate what I mean with this gap and how important are this new-growth ideas to cover it up. The “larger your company’s growth gap, the further from your core those innovations efforts” would have to be… I’m really excited with this statement, hungry for new developments. We bring the best datacenter service in LATAM in terms of redundancy, infrastructure and managed services. We are extending our services to new countries and regions. This year we would open a new datacenter in Perú. This is a beautiful way to innovate for new growth, take something we do great to other geographies/markets. We have released KoolFit last year as our response to the cloud market. KoolFit is centered into a Private Cloud demand. Also, we are bringing managed service at the application layer over KoolFit to improve its performance and redundancy taking advantage of all automation features that technologies like Openstack, OpenVSwitch and Ceph could offer. We used to bring managed services in our former Cloud Infrastructures. Just a limited orchestration only over some sort of virtual servers. Security and network resources were absolutely out of our scope. .
KoolFit is other new-growth innovation with some distance of our today’s core services. But, we are pretty sure this initiative will grew fast and it will contribute to reduce the gap that we have between the current business growth rate and our long-term goals. Now, let’s go to the next step in our innovation engine. As the HBR’s article says it’s very important “focusing innovation efforts on a small number of strategic opportunity areas”. Many times I want to do so many things simultaneously, that I forget that I don’t have unlimited resources. It’s really important stay focus into the global business strategy, and prioritize ideas, and identify how many resources you will need to turn them out into something profitable. My case I am taking care of sales support as part of my responsibilities. We have a permanent contact with customers and the sales teams. Almost every week we’ve got some feedback asking from some services that are not in our current portfolio. This sort of information help us to identify some “unmet needs” from customers”that could be the foundation of a new-growth innovation”. KIO don’t have a dedicated team to “take a close look at new-growth efforts currently bubbling up inside your organization” and track them periodically. However, in our defense, our board is a team with a permanent interaction that help us stay updated with any possible innovation effort sourced from any spot of the company. Always there will be a sales director sponsoring an idea, and the others will have to provide the required resources, even me of course. The idea’s sponsor will have to sell that to the other board’s members. KIO don’t waste time to take any decision and turn that into immediate actions. “A job that many potential customers need to do that no one is addressing very well”. For instance, our HANA OnDemand service helps customers to rapidly implement an end-to-end solution (from HANA platform to mobile dashboards) to get real-time analytics from any business KPI they want. No one is addressing this sort of need in LATAM particularly, some providers are just covering some pieces of this implementation leaded by a large system integrator that probably will end in failure or away from what the customer was expecting. “Either a technology that will enable customers to do that job much more easily, cheaply, or conveniently, or a change in the economic, regulatory, or social landscape that is greatly intensifying the need for that job”. This process will help you to “direct the energies of forward-thinking employees” At least to get the understanding of what NOT to do! and avoid “common innovation traps”. To get dedicated resources, it’s very important to reduce the scope of the most important tracks to just a couple of projects. Every project is like a child that need to be fed and cared until it can walk by itself. The sponsor will be a father that need to dedicate or ensure that it will be get dedicated efforts to reach the expected business objective. As a father, you have to be sure that the people involved will have “pertinent experience to staff the MVIS”, or your child will head just to deception and failure. You can free up resources from zombie projects that heads to nothing and reward people for killing these unnecessary initiatives. MVIS would identify business’s misaligned innovation projects and will support their extermination and the reassignment of their resources. Finally, don’t forget to consider a process checklist to “make sure we haven’t left out any critical step”. Of course, this will help you to standardize this part of your 90-days’ system, and make this process repeatable – practice makes perfect. 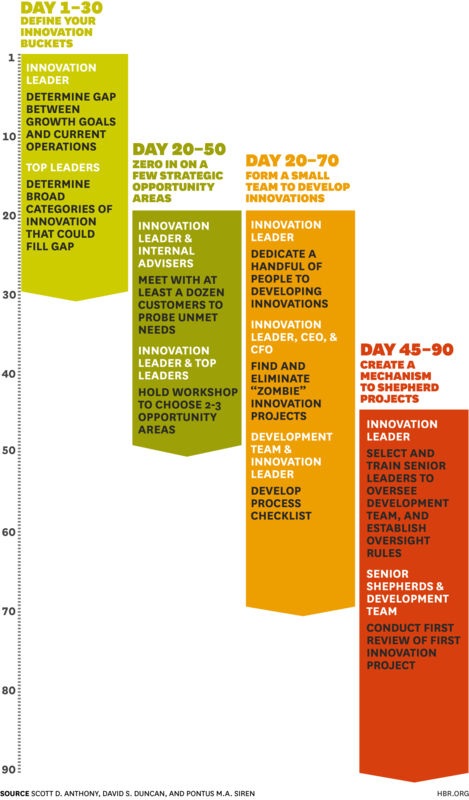 You will find in HBR’s article a list of books about innovation that will help your MVIS team to build this checklist. Well, see you next Tuesday into the final piece of this story.